Are you looking for jar labels? One of our most popular label types with have a large collection of labels for jars. If you’re making jams, jellies, marmalade, curd or preserves, whether for gifts or for sale, it’s always worth getting prepared in advance. Perhaps you’ve already made and bottled your jam or marmalade. If you’re using fruit that you’ve frozen or bought, the jam-making season can be any time of year! We believe that it’s best not to rush the labelling process. You can create different designs, save them and go back to them later using the Avery WePrint design tool. If you’re preparing to label several different types of jam or if you’re running a small business, you may want to develop a consistent ‘look’ over different products to build a professional looking brand. Big brands always run trials and tests before deciding on designs and branding. You can easily experiment with different designs, label shapes and label materials with Avery WePrint because of the low minimum orders. Don’t forget to ask for feedback on your experiments! The most important aspects of label design are making sure that the words describing your jam are easily visible using a large, clear typeface and that they do not blend into the background. There are regulations to take into account if you’re selling your produce to the public, explained further on. Commercial jam jars tend to have fairly large labels because the label is used to sell the product. 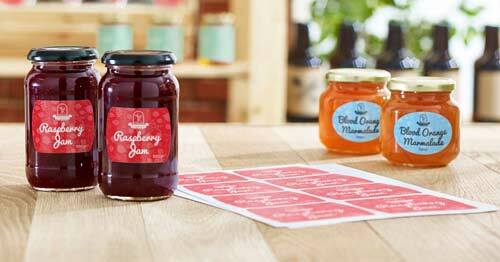 We find that rectangular, oval and plaque labels are most popular for the front of jam jars. Rectangular and oval labels are most often used for information on the back. It’s always wise to measure your jars before you choose your label shape and size – don’t guess! Brown kraft paper gives a rustic, organic look (you can also add handwriting), while clear labels have a translucent look, as though the glass has been printed. Textured paper will give your labels another tactile dimension. Plastic and paper labels also give a professional look and can have a gloss or matt finish, with the added choice of a natural finish for paper labels. What should your labels say? People need to know what’s in the jar! A clear and accurate description of the contents and the ingredients is always important, whether you’re selling or giving away your jam. If your jam is for sale to the general public, you do need to be aware of regulations for jam, marmalade, mincemeat and other similar products. Every business is responsible for ensuring compliance and any questions should be directed to your Local Authority Trading Standards Department which will enforce regulations for the relevant Food Standards Agency. The Jam and Similar Products Regulations (England), for example, state how much fruit must be contained per kilogram of the finished product (‘compositional requirements’). These regulations also cover additional ingredients such as juices, wines and spices, and the permitted treatments. If your jam or preserve meets the compositional requirements, it must be labelled with the name of the fruit, such as ‘strawberry jam’. Fruit and sugar content must also be shown. A nutrition information declaration consisting of the energy value and the amounts of fat, saturates, carbohydrate, sugars and protein. The use of the term ‘organic’ and the use of prescribed names are also regulated. The quantity of food that characterises the food must also be declared in the ingredients list. For jam made from a single fruit, for example, this would mean stating “Prepared from ×g fruit per 100g”. Please make sure you refer to the regulations or your local Trading Standards Authority for full details.